Minced mermaids! | Out Damn Swatch! Nails. Polish. More of the same. Back when I was getting acrylics (which I wore for 3+ years!) OPI’s Catch Me In Your Net was my favourite shade in my nail tech’s collection. The first time I wore it I excitedly told her it looked like minced up mermaids, and the name stuck. So a few months ago I decided to try to buy this shade that was so pivotal in beginning my polish obsession. It’s a teal blue jelly base packed full of blue and green micro-glitter and gold foil flakes. Super glittery and eye-catching. 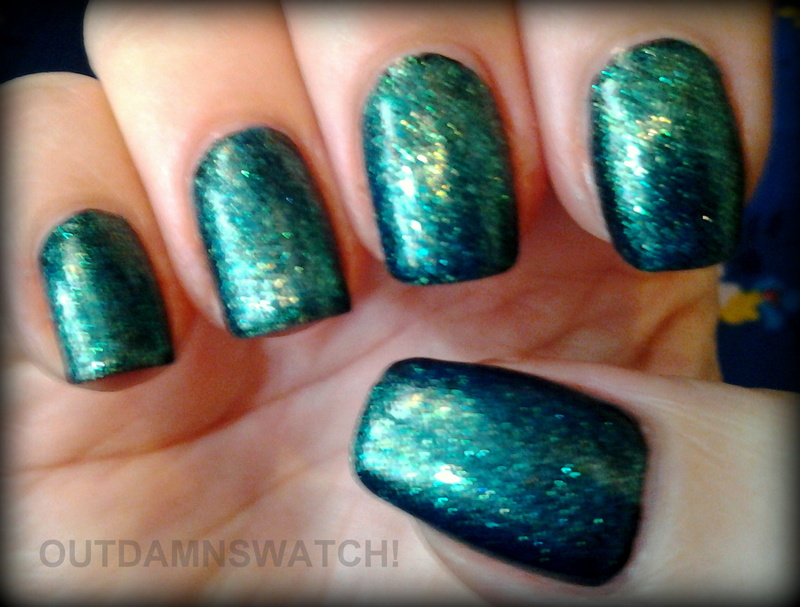 I wore this mani about a month ago (am playing catch-up). The problem was that Catch Me In Your Net is a limited edition and near impossible to buy. Occasionally you can find it for $$ on ebay. Yeah nah. So I did some searching and discovered that it is but one of many dupes (a then-unknown term to me). There is OPI Catch Me In Your Net, Zoya Charla (the original I believe), Orly Halley’s Comet, Essence Choose Me!, Jesse’s Girl Glee, Accessorize Mermaid, NYX Girls Sea of Cortez, and a near-dupe in Wet n Wild Teal of Fortune. So, lots of choices and a lesson in looking for dupes if you have your eye on a hard to get or expensive shade made by one particular brand. I ended up buying NYX Girls Sea of Cortez from BeautyJoint.com (misnamed here as Sea of Glitter, but the polish code is NGP200). Two of many... (Sea of Cortez is on the left and the right.) Image source. I was very chuffed! 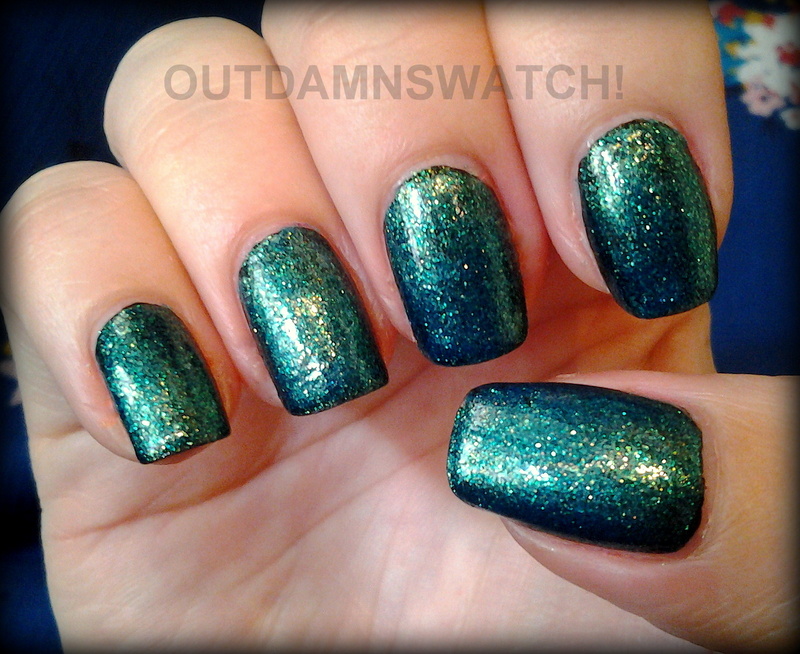 One of my original favourite shades, for a fraction of the limited OPI price! They’re identical and the NYX Girls formula is just as easy to work with. And the price difference? 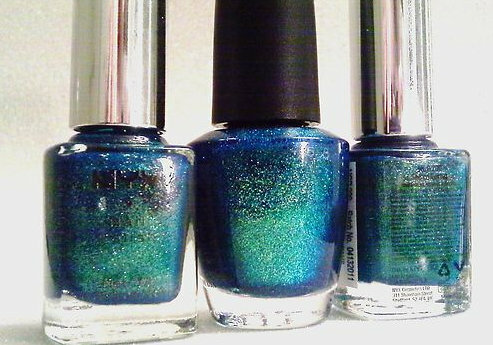 Well let’s just say Sea of Cortez set me back US$1.99 (excluding shipping with other polishes). I layered 2 coats of it over China Glaze Liquid Leather (black) to give it a slightly darker background flash at the edges of the nail than it usually has. It works great as a layering polish in general as well as becoming fully opaque in 2 to 3 coats. The finish is very foil-like and is easily smoothed out with a couple of layers of top coat. I fell in love with it all over again! Deliberately blurred to show the glitter flashes. I’m going to find one of those dupes! This is a fabulous color! Thanks! Glad this helped! It’s definitely great when there are cheaper alternatives out there. Excerpts and photos may only be reposted with full credit and back links to this blog. No content may be reproduced in full without prior permission.